10,000 years in the future, the world has become a very different place; monsters roam the land freely, and people, although equiped with high tech weapons and cybernetic horses, live a humble life more suited to centuries past. This story focuses on a small hamlet plagued by monster attacks and living under the shadow of the rule of Count Magnus Lee, a powerful and very ancient vampire lord. When a young girl is bitten by the Count and chosen as his plaything, she seeks out the help of a quiet wandering stranger, D. It so happens that D is one of the world's best vampire hunters, and he takes it upon himself to cut through Magnus Lee's many minions, and put an end to the Count's rule. 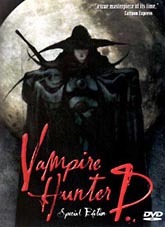 Vampire Hunter D [VHD] is popular, but if you ask a fan they won't know well. You see VHD was made in the early 1980's and the character designs were done by Yoshitaka Amano, the character designer on the final fantasy games. VHD is once again based on a popular Manga, and tells the story of a future world ruled by Vampires. Magnus Lee is the big bad who D has to go up against, however the big question that has to be answered, is 'How is a mere half human, half vampire so strong'. The answer is obvious, but the story of VHD is unhurried and everything takes time, which is a good thing. D is a wandering man for hire, who is far too cool and relaxed. Imagine him as Clint Eastwood! To counter D's cool personality he has a parasite in his left hand. Why? Well the anime never explains, so go read the manga! VHD battle sequences and OTT blood is similar to that found in the Fist of the North Star anime series. All in all VHD is a good entertaining anime, which is available for £9.99. The remastered job is very average, but the commentary is a welcome edition, though maybe a little to exiteable in places! A sequel is also available, but the original still has all of that old school static charm.